The gumbo is a soup-stew characteristic of the Creole cuisine of African elements consisting of spicy Cajun sausage, pulled chicken, wild gulf shrimp, crawfish tails over aromatic rice. This event is free, and open to public. Click to RSVP strongly encouraged! An urban love story about the soul of a mother, the heart of a fighter, and the faith of a child. Join us for this Black History Month screening. ADMISSION : FREE RSVP STRONGLY ENCOURAGED. Scrreening feature post screening discussion and delightful culinary bites to compliment the film's theme. Click to RSVP. Each month come savor provacative independent films paired with the culinary genius of Chef Lamar J. Moore. Special free food events are hosted weekly at ArtHouse to compliment the business and training activity in the facility. Culinary Exploration events are facilitated by local and regional experts, and are free and open to the public. Events are appropriate for novice to expert: growers, food hobbyists, enthusiasts, culinary entrepreneurs, butchers, caterers, bakers, food vendors, chefs and restaurateurs. No experience is necessary to participate in Culinary Exploration events. the Gary community now has a local food policy council. Formation efforts started in the spring of 2017 and the group now meets on a regular monthly basis. The Gary Food Council’s mission is to deliver sustainable solutions and opportunities for healthy, local food access within our Gary neighborhoods. The goal is to have city government and local businesses and community residents work together to achieve success in meeting a variety of an ever growing list of goals. We would like to invite you to join in the movement by representing one or more of the above segments at the food council meetings. Remember, at minimum, we are all food consumers and the meetings are open to the public, so your voice is needed. Please consider joining us. Feel free to call me for more information about how you could be involved. SHOP 12:30pm – 3pm (only). Price $ ($5.00 per order) This event is free to enter building, and open to public and your RSVP on Eventbrite is only for entering the building. Chef Lamar has maintained a progressive culinary career with more than 15 years of experience from sports stadiums to restaurants and now hotels. As the Executive Chef of Hotel Chicago – a 354-room property that is a part of Marriott’s Autograph Collection, Chef Lamar is responsible for providing our guests with an extraordinary culinary experience. In addition to the menu development for in room dining, including the creation of the Bar and Executive Lounge Menu, Chef Lamar coordinates the culinary experiences for various banquet events including weddings, parties, and corporate events. Chef Lamar is a qualified Professional Chef, holding a degree in Culinary Arts from Le Cordon Bleu in Chicago. He has traveled the world to Europe, Greece, and throughout the United States extending his knowledge and expertise of international cuisine by visiting local markets and restaurants. Chef Lamar has extensive expertise creating dishes in a variety of cuisines ranging from Latin American to Peruvian as well as American and French fine dining. He takes pride in the relationships he has developed over the years and always does business with local farmers who produce the freshest ingredients. As a member of the American Culinary Federation, Chef Lamar has connected with other professional Chefs as well as mentored aspiring Chefs. As the Keynote Speaker at the National Restaurant Association Show, Chef Lamar provided over 1000 future Chefs with insight, guidance and direction. Chef Lamar has also been featured in many media outlets including Zagat News Weekly, PlateOnline.com, and the Chicago Tribune, just to name a few. Giving back to the community is important to Chef Lamar. He has graciously accepted the role of mentor and leader for ProStart and volunteers to share his culinary experience with local Chicago Public School students by conducting demonstrations and workshops. These workshops are designed for a range of participants - from the novice culinary entrepreneur to the burgeoning and/or home-based business owner with the desire to grow their culinary concepts into viable and profitable businesses within the city of Gary and throughout NWI. Workshops are designed to help participants understand the various relational aspects of business partnerships, customer relationships, and financials and budgeting. There may also be opportunities to experiment with your business concept via a Pop Up Cafe and to pitch your business to investors. This is a FREE learning and networking opportunity for burgeoning and/or home-based culinary entrepreneurs! DIY Videography for your business – Every entrepreneur needs video to market and promote their business, however, videographers are very expensive. This class teaches you how to capture and edit great pictures of your products and team with your smartphone, tablet, or a simple camera. Ken Patrick is a graphic designer, photographer and videographer who has a talent for producing great content with little to no budget. He is the ultimate media “Do It Yourself” guru. Sybil Peeple of Sybilicous Cupcake Café will feature one of their catering menu item favorite. The smokey grilled chicken sandwich with a honey mustard coleslaw on top of a toasted sourdough bread. Come spend your lunch hour with Sybil and ArtHouse! DIY Photography for your business – Every entrepreneur needs photographs to market and promote their business, however, photographers are very expensive. This class teaches you how to capture and edit great pictures of your products and team with your smartphone, tablet, or a simple camera. Ken Patrick Barry is a graphic designer, photographer and videographer who has a talent for producing great content with little to no budget. He is the ultimate media “Do It Yourself” guru. Maurice “Blaque” Shelton, originally from Chicago turned Gary, IN resident, is award winning Sugar Artist, Instructor and the Owner of Black Rose Pastries, LLC. Since 2007, he has been trail blazing across the world delighting the palates of thousands, with his “SImply Delicious Incredible Edibles!” . He has been featured on WGN 9, ABC 7 Chicago, Miami New TImes Newspaper and various others articles and publications. He is best known in the Industry for his incredible eye for detail and cross between realistic/naturalistic sugar showpieces. Most recently he is taking the world by storm with his Artisan Cupcakes! Sign up today as he reveals some of the industry secrets, tips & tricks! Flavor! is a cooking demonstration class offered in varying sessions. Participants can attend all sessions to get the full palate experience or register for the Flavor! of their choice. Chef Raz will lead participants on focused exploration of essential ingredients cooks regularly use in recipes. Each session is divided into two portions: sampling and exploring the ingredient and incorporating it into a dish. Participants will learn a new approach to looking at flavor components and different ways flavor is part of commercial success of food. The goal is to discover what makes food taste good and what makes food taste great! The Flavor! for this week is MUSHROOMS. The Talk: Mushrooms and caps. White mushrooms. Brown Mushrooms. Workshop: A closer look at taste with Mushroom Soup and Salisbury Steak with Mushroom Gravy. YOU MUST BE 21 AND OLDER TO ATTEND AND PARTICIPATE. The ArtHouse "Anniversary Bake-Off" celebrates another year of art, culinary entrepreneurship, and community accomplishments for the City of Gary. Guests will enjoy live music, desserts and a new photography exhibition of public art projects in four cities. Renowned jazz musican and Gary resident, Art Hoyle, will lead the Art Hoyle Sextet in a jazz set during the opening reception for the public art photography exhibition and dessert bake-off. Exhibition documenting four public art projects in four cities–Los Angeles, California, Spartanburg, South Carolina, Albany/Schenectady and Troy, New York and Gary, Indiana. Each city is a recipient of Bloomberg Philanthropies' Public Art Challenge. Treats and sweets baked by ArtHouse Culinary Business Incubator graduates competing in a bake-off. This event is FREE and open to the public. RSVP STRONGLY ENCOURAGED! The Flavor! for this week is GINGER. The Talk: Fresh ginger – young and old. Dried ginger. Rhizomes in the kitchen. Candied ginger. Workshop: A closer look at taste with ginger lemonade and Indiana Persimmon Pudding. Marty Astorga is an owner of Food Safety & Quality Systems, LLC and has been in the food industry for over 30 years in various management positions from first line supervisor to Plant Manager. Marty has worked with top industry providers such as Tyson Foods, Nutra Sweet, Pinnacle Foods, Tootsie Roll, and Select Beverages. Join out neighbors at the Steel City Salvage Pop-Up Shop on Saturday, November 4th from 10 AM – 3 PM at 716 E. 5th, Gary, IN! DJ CiTy MiX will be spinning and there will be delicious food by Kalifornia Jones Co. Don’t miss this fall day of family fun! Admission for this event is $25.00! The theme for this event will focus on individuals who have participated in the ArtHouse's Culinary Business Incubator. Our event partner Seedling Distribution, Seedling University and Market, is a total community placemaking initiative that seeks to build grocery stores, leverage grocery store as distribution center for mobile markets, and train local residents as entrepreneurs and staff. PitchFeast is a 501(c)(3) public charity and crowdfunding dinner, which serves as an innovative fundraising program for small businesses, under-resourced entrepreneurs and creatives. It is a monthly community meal in which a ticket gives you not only food and fellowship, but also the opportunity to FUNdraise for a creative, Indianapolis idea. PitchFeast welcomes all kind of creative types for a unique crowd-sourcing competition that leverages the power of the community to fund innovative ideas. Attendees pay a nominal entry fee and that fee provides them with dinner, beverages and one vote. Guests then hear the innovative ideas of locally based entrepreneurs. Each entrepreneur is given 3-5 minutes to pitch their ideas and concepts to an audience who will then vote for the one they like the most. The winner of the “PitchFeast” receives a cash prize, in addition to other professional services that contribute to the development and sustainability of the business or social project. Tickets may be purchased at the door, EventBrite or by downloading the Givelify app. www.givelify.com Once on the app locate Pitchfeast and make a $25.00 donation with your name, that is considered your ticket purchase. 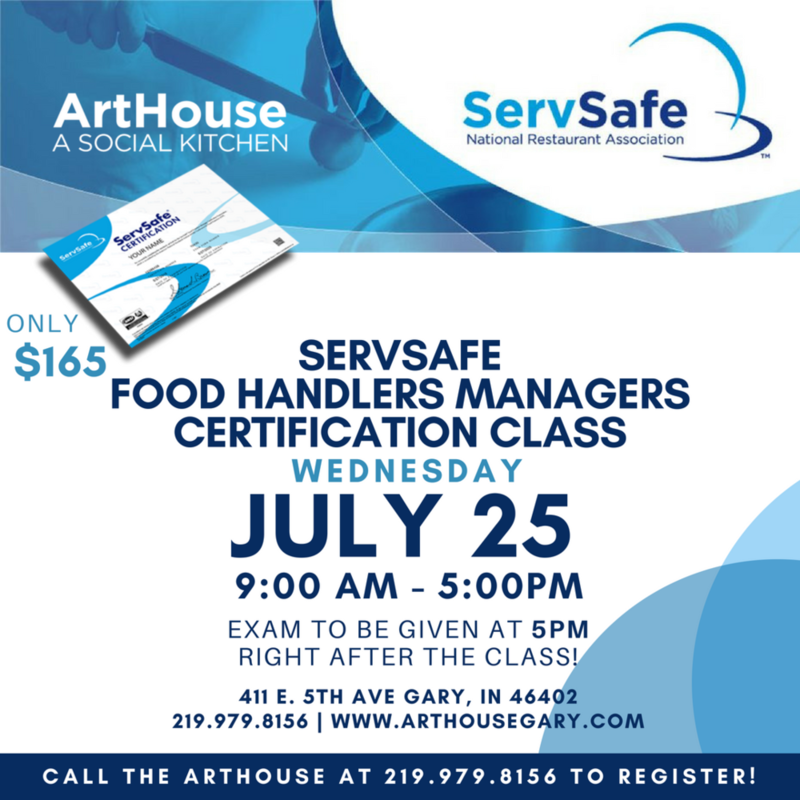 ArtHouse: A Social Kitchen will facilitate ServSafe Food Handler training for those requiring Food Handler certification. Training is scheduled by this RSVP. Trainings are scheduled every other Friday beginning October 6, 2017 from 12:00pm to 5:00pm. The last class is scheduled Friday, November 17, 2017. The ServSafe Food Handler Program is a complete solution that delivers consistent food safety training assessments for employees. The cost is $12.50 per person and includes materials, instruction, and examination. This is a FREE RSVP for the event. All participants will pay at door. Every Saturday beginning August 12 through October 21, 2017 with the exception of September 2, 2017 due to holiday weekend. These workshops are designed for a range of participants - from the notice culinary entrepreneur to the burgeoning and/or home-based business owner - with the desire to grow their culinary concepts into viable and profitable businesses within the city of Gary and throughout NWI. Workshops are designed to help participants understand the various relational aspects of business partnerships, customer relationships and financials and budgeting. There may be also be opportunities to experiment with your business concept via a Pop-up-Cafe and to pitch your business to investors. ServSafe Food Handler Certification, and more! Passionate about food and the food industry? Want to get connected with our growing Northwest Indiana food system? Come meet the NWI Food Council team and others with related interests as we continue our new series of casual meet-ups. For those of you that were at FED: Food Expo & Discussion in March, we've listened to your requests for more events and opportunities to network. Here's your chance to continue the conversations you started there and start new ones. We look forward to seeing you again! For those of you new to the NWI Food Council, come out to a meet-up and introduce yourself! These meet-ups are an informal opportunity to relax and talk to others interested in eating local, supporting local food businesses and farms, and advocating for our local food systems. This event will be family-friendly, and admission is free. Members of the NWI Food Council board will also be on hand both evenings to answer questions about upcoming events, the goals of the Council, and opportunities to get involved. This event is FREE, but space is limited. RSVP is required. CLICK TO RSVP. ArtHouse: A Social Kitchen will facilitate ServSafe Food Handler training for those requiring Food Handler certification. Training is scheduled by this RSVP. Trainings are scheduled every other Friday beginning July 14, 2017 from 12:00pm to 5:00pm. The last class is scheduled Friday, September 8, 2017. Space is limited. RSVP is required. CLICK TO RSVP.